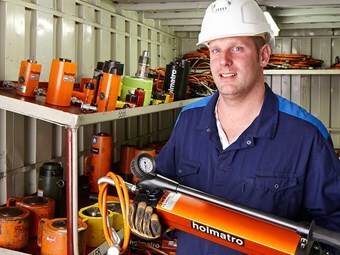 Dutch company Holmatro, which makes hydraulic equipment and systems for use in rescue, industrial and special tactics operations, has introduced a new series of industrial hand pumps. They’ve been designed to withstand rough treatment and are not affected by rain or sand, Holmatro says: "From experience we know that not all employees treat tools with equal care. That's why the new Holmatro hand pumps are very robust. The pumps are also very service- and maintenance-friendly. All technical parts are very accessible and modules can easily be replaced without disassembling the tank." The pumps have a number of user-friendly features, including an oil-level glass which allows the user to easily check the oil level in both horizontal and vertical position, a ‘Push & Unlock’ pump handle lock, integrated oil funnel and easily readable pressure gauge adapter on the pump block. A high oil output means quicker action both in the first and second stage. "All of our products are developed, produced and exhaustively tested in-house," Holmatro says. "The result is true Dutch quality and robustness. Moreover, our products have an extremely long life span that can also be extended with an extensive service programme."